Hospitality Lawyer with some insights on the “amazing relationship” between GDP and hotel room demand. What does it mean for the lodging industry when the “recovery” finally comes? Going back to the 1920s, there has been approximately a 1 to 1 relationship between the demand for hotel rooms and the U.S. gross domestic product (and its predecessor, gross national product). The long-term trend line for the GDP and lodging industry demand have been parallel, even during the Great Depression and World War II. For some brief periods, this relationship was off a bit, but never as badly as with the current economic crisis. During the Great Recession of 2008-2009, the demand for hotel rooms has fallen FOUR times as fast as the GDP has declined. This creates some very interesting speculation. For example, when the recovery finally does come, will the old 1 to 1 relationship be restored? Will the lodging industry start improvement from its then-current level on that 1 to 1 basis? Or will the lodging demand “snap back” to the GDP curve, making up for that historic 4 to 1 distortion we have just experienced on the downside? Since the 1920s through the year 2000, the long-term trend line for the GDP and the lodging industry demand are parallel, even during the Great Depression and World War II. What are the implications of two recovery scenarios? 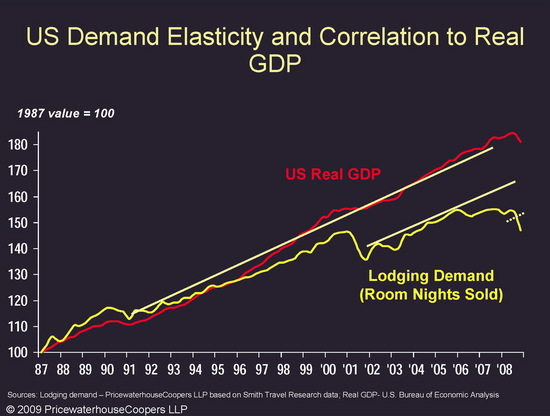 The historic 1 to 1 relationship of lodging demand and the GDP is now broken. Most likely it will eventually be re-established. When it the relationship is re-established, it might occur in at least two different ways. Lodging demand might “merely” resume its traditional 1 to 1 relationship with GDP — resuming it from its then-current, depressed level (see the chart below for a easy-to-understand graphic explanation of this). If it did so, this would effectively represent a “RESET” of the lodging demand curve. Unfortunately, there is at least one precedent for such a reset earlier this decade (surrounding the events of 9/11). Such a resumption of relationship with GDP would likely indicate a long, slow recovery for lodging if predictions are accurate for a slow and “jobless” economic recovery. The alternative imagined by some thought leaders envisions lodging demand recovering at 4 times the rate of the general economy — as part of a “snap back” to make up for the unprecedented 4 to 1 decline we have just experienced. Such a snap back would create some very interesting and positive results for hotel profits and hotel values! And then [after 2002] an interesting thing happened. The hotel room demand curve started once again began to run parallel to the long term trend line for GDP but at a level measurably below the prior trend line. This represents a “RESET” in the base point of the trend line. When does the recovery come? What does it look like? While the economy is no longer in disastrous free fall, we are not convinced that it has bottomed yet or that a fragile recovery won’t be destroyed by “other shoes” yet to drop. We also worry that a lot of things need to be fixed before we can bottom, and more importantly, there is a difference between bottoming out (or getting “less bad”), and a significant, sustainable upward inflection which indicates a “recovery.” Undoubtedly, a recovery will come first for the U.S. economy, and then be followed by some potentially significant lag period before recovery comes to the hotel industry. Experts have various theories on what the recovery curve will look like. Some speak in terms of calendar quarters and say the recovery will be slower or faster. As Mark Woodworth of PKF Hospitality Research said a couple of weeks ago: Others compare the recovery curve to letters, such as a V-shape to describe a fast bounce back, a U-shape for a slower recovery, an L-shaped “flat” recovery or a W-shaped double dip recession. We have talked about some of the factors affecting the timing of economic and hotel industry recovery here at www.HotelLawBlog.com (see some of the articles hyper linked at the bottom), but today we are going to focus on some basic factors affecting supply and demand. The fortunes of the hotel industry are driven by basic supply and demand. Over the past decades we periodically have created an oversupply of new hotels. Excesses on the supply side have often caused hotel occupancy to drop and have sometimes caused hotel price wars which further depress the average daily rates (or ADRs) on the reduced number of rooms occupied. In fact, the supply of new hotel rooms opened in 2008 and 2009 are on track to well exceed the 1.9% 20-year average increase of supply, suggesting oversupply. But supply is only part of the equation. What is happening to the demand side of things as measured by room nights sold, or how many hotel rooms are occupied every night? A big enough increase in demand for hotel rooms could offset increasing supply, while decreasing demand would aggravate problems caused by oversupply. Here is one of the most recent summaries of what has been happening with hotel supply and demand over the past couple decades. And you can see the increased supply and dropping demand that accompany the present financial crisis being experienced by the hotel industry. How can we predict changes in supply and demand, and therefore the future of the hotel industry? 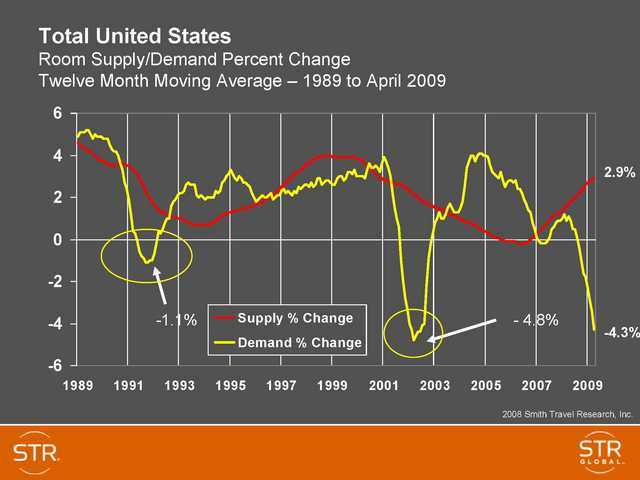 Predicting new supply is relatively easy. Various consulting firms track detailed information about everything from project planning, entitlements, building permits, construction starts and openings to provide a pretty good indication of the supply “pipeline” of new hotel rooms being built. But predicting changes in demand for hotel room nights can be a bit more challenging. This is frequently done by looking at the statistical correlation between certain measurable events and changes in room demand. The closer a correlation is to 1.0, the better statisticians will tell the events studied are predictors of what a change in one event will have on the other. Note that for 24 years (1967-1991), the correlation between the U.S. GDP and hotel room demand was 1.2! That is a very high correlation, making changes in GDP an excellent predictor of what will happen to hotel room demand. Basically, for every percent change in GDP, there is an equal percent change in hotel room demand. If the economy “improves’ with a 3% increase in GDP, hotel demand will increase with the same 3% growth, and the same when the GDP declines. The 7% correlation that existed for another 9 years from 1991-2000 was exceptionally high. 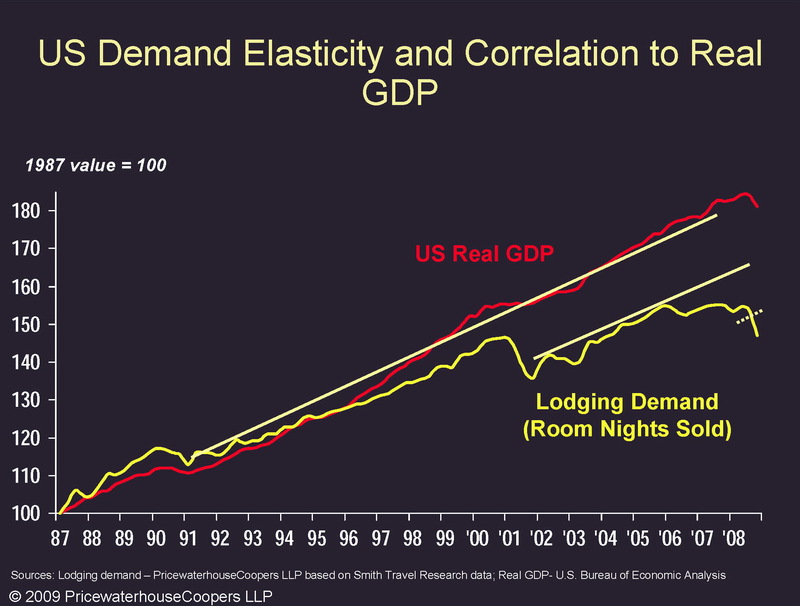 So for 34 years (from 1967-2000), there was a very high correlation between us GDP and hotel room demand. This exceptional correlation was disturbed for a couple of years in 2001 and 2002, but then looked to be getting back on track, until the last couple of years when something seemed to happen. Looking at the correlation in the “Great Recession” of 2008-2009. Just last month at the NYU hotel conference in New York City, Bjorn Hanson, Ph.D. updated the information with this graphic. It has some interesting implications for predicting what happens to recovery in the hotel industry. The long yellow “trend line” generally on top of the red U.S. Real GDP line, just smooths out the curve of the plotted GDP. But for the period 2001 to 2004, the long-term trend line for lodging demand fell far off the long- trend line of GDP. There was still some relationship, but the 1 to 1 correlation “got broken” or substantially less close in 2001-2002. And then an interesting thing happened. The hotel room demand curve started once again began to run parallel to the long term trend line for GDP but at a level measurably below the prior trend line. This represents a “RESET” in the base point of the trend line. A critical point to note is the dramatic fall off in hotel room demand with the Great Recession. In fact hotel room demand has decreased more than 4 times as fast as the GDP has decreased! Does hotel demand “snap back” to previous levels or does it RESET at a new lower level? The long history of close correlation between hotel room demand and GDP suggests that eventually the “normal” correlation of close to 1 to 1 will be re-established. But there are two ways this might happen (if it does happen at all). What supports a “snap back” of demand? At our annual Meet the Money® Conference in May, some of our industry thought leaders were excited about the prospects for great bargain purchases of distressed hotels followed by very strong recovery potential for the hospitality industry. They reasoned, in part, that the 4 to 1 correlation for hotel demand drops in the failing economy brings chance-of-a-lifetime bargains for those with capital and patience. They also foretell a 4 to 1 “snap back” in the hotel room demand when the historic correlation is re-established in an economic recovery. This optimistic view would also be supported by Smith Travel Research predictions for stronger than might be expected recovery in the hotel industry once demand starts ticking up. They think that we regain price control or price discipline, and that even small increases in demand can provide greater proportional recovery in rate and therefore strong recovery. Marc Lomanno and his colleagues also find prospects of diminishing supply encouraging for a disproportionate recovery of lost rate from the price wars. What’s the alternative of a reset? The alternative scenario is a RESET of demand growth at a substantially lower level for the future, much like what happened around 2003-2004. There was no “snap back” from the declines suffered in 2001 and 2002. 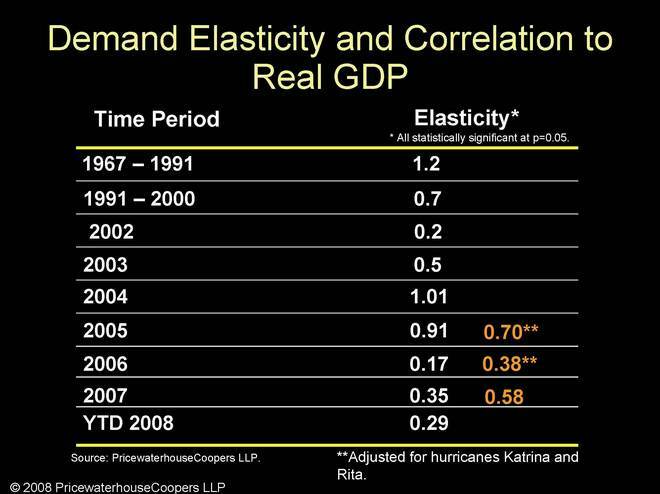 The entire demand curve just resumed its closer correlation with GDP at a lower level. Factors supporting this pessimistic view are the fact that after the recession of 2000 and 2001 (and the 9/11 effect) it took the hotel industry 6 years to get back to the price levels enjoyed before the downturn. The price wars of 2008 and 2009 are still underway and the price cuts are much more severe. Many worry that our price cutting approach in these perilous times have taught our customers that price is more important than anything else, and that more cautious consumers will be more price conscious anyway. Coupled with prospects of a “jobless recovery” that may take 5 or even 10 years to replace the 3.5 million jobs lost since December 2007, the L-shaped, slow recovery could dampen any spring back to peak levels for many years. We are hoping for a snap back, but there are a lot of reasons we might not enjoy that. What do you think? Snap back or gradual resumption of relationship from a lower base point? This article is based on the research, presentations and musings of Bjorn Hanson, Ph.D.
Bjorn Hanson is a member of the faculty of the Preston Robert Tisch Center for Hospitality, Tourism, and Sports Management at New York University and the chair of the Tisch Center’s Advisory Board of industry leaders. Widely respected for his industry forecasts and for having created econometric models that transformed business analysis in the field, Bjorn was formerly the global industry leader of Hospitality and Leisure at PricewaterhouseCoopers LLP. I wrote the article with several years of notes that I have taken at Bjorn’s many hotel industry presentations at industry conferences, and some slides he was kind enough to share with me. The credit for all information I have accurately assimilated belongs to him, and if anything here is incorrect, please assume that the error is mine.